Single-use plastic bags are used only for a few minutes and then thrown away. Each citizen of Montenegro use in average 400 to 600 single-use plastic bags per year and none is recycled in Montenegro: in the best case, if they do not end up in nature, they are piled up in landfills. Zero Waste has started a national petition in July 2017 to ban once and for all single-use plastic bags in Montenegro. Update 07.09.2017: Dragan Asanovic, General Director of the Waste Management and Communal Services Directorate of the Ministry of Sustainable Development has informed us he is willing to amend the directive regarding plastic bags and packaging and asked us to make a proposal of implementation plan for our proposal. We expect to have it finalized by end November 2017. Update 10.01.2018: The Ministry asked us to provide support with drafting the revision of the legislation with the aim to ban plastic bags. We expect to get the EU Commission via its TAEIX instrument on board, which can provide relevant legal expertise to the Montenegrin Government, in order to finalize the legislation. We have been preparing by researching, collecting and translating laws from different countries which have successfully passed such legislation recently (France, Kenya). As we don’t have any in-house legal expertise in our team of volunteers, we are constantly looking for collaboration with experts in the area to assist us in the drafting process. Once finalized, we will submit the draft legislation to the Ministry. This is the first step before the implementation plan can be finalized. We expect to have a first draft available by the second quarter of 2018. Update 03.09.2018: The Ministry of T&SD should submit any day now the draft proposal for the Packaging and Waste Packaging, in line with the EU Commission Directive. This should include among others the new law on plastic bags (despite our ongoing lobbying, we expect a taxation of the plastic bags but there is very little chance that a ban will be taking place). It will also include a bottles Deposit Refund Scheme as EU Commission requires 90% of bottles recycling by 2015, which can only be achieved through a DRS system. We did recommend the government to have a centralized not-for-profit organization managing the bottles DRS, organization to be created and managed by the retailers, importers and producers of bottles, with strict reporting requirements. This model has been shown the most successful approaches in many countries. (Beverage containers comprise 40-60% of litter, so such a scheme can have a great impact on littering reduction in Montenegro). A well implemented and well managed deposit scheme doesn’t cost more than 0,01€ per bottle. Do you know how many citizen have signed the petition? 500 offline + 3137 online! Plastic bags pose a grave threat to the livestock and wildlife in Montenegro and also contribute to increased pollution levels on and in waters, clogged drainage systems and polluted environment included in the most touristic areas of the countries. Single-use plastic bags is the most relevant example of bad design since they are designed to last several hundred years and are being used just a few minutes* and then thrown away. Each citizen of Montenegro uses in average 600** single-use plastic bags per year and none is recycled yet in Montenegro: in the best case, if they do not end up in nature, they are piled up in landfills. The environmental and social costs of single use plastic bags is huge. Even biodegradable bags (oxo) which are wide-spread in Montenegro survive long enough in nature to harm wildlife and spoil the beauty of our country. France, Kenya, Italy, Rwanda, and many large cities from USA, Australia and UK banned the single use plastic bags and the oxo degradable bags. Romania is also on the way to approve a national ban on plastic bags. Countries like Belgium, Denmark, the United Kingdom, Finland, Luxembourg, The Netherlands, have opted to place a tax on them instead, which has produced some promising results, but banning lightweight plastic carrier bags remains the key solution over taxation. 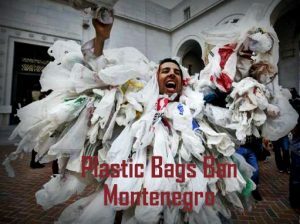 Considering that Montenegro will need to take action and transpose the EU legislation in the light of its upcoming accession to the EU, to make this shift possible, we urge you to take a courageous stand today and ban the lightweight plastic carrier bags and oxo degradable bags completely by the end of 2018. It will leave 18 months for distributors to organize themselves and finish their stock of bags before the ban enters in action. Zero Waste Montenegro and Zero Waste Europe experts are offering technical support to the Montenegrin government with the implementation of the lightweight single use plastic carrier bags and oxo degradable bags ban. Scott Perry | Director | Montenegro Eco Adventures D.O.O.